Some parts of our bodies can repair themselves quite well after injury, but others don’t repair at all. We certainly can’t regrow a whole leg or arm, but some animals CAN regrow – or regenerate – whole body parts. So what can we learn from these regenerative animals? Salamanders, planarians and a number of other species regrow damaged or missing body parts. This is regeneration. Some human organs, e.g. liver and skin, also regenerate when they are damaged. Studying regeneration in other species will help us understand how the human body heals and repairs itself. This could help researchers develop regenerative medicines to help the human body more fully heal. Researchers are investigating many aspects of regeneration, from the signals that turn on regenerative processes to why stem cells in humans don’t regenerate the way salamanders do. Many scientists are interested in understanding what promotes stem cells to form a blastema, an accumulation of stem cells at the point of tissue damage. Studies in animals like salamanders are also attempting to determine how stem cells know what parts of the body need to be regrown and where they are in the body’s ‘map’, two things stem cells in mammals don’t do. Researchers are very interested in understanding what signals turn stem cells ‘on’ when regeneration is needed, and keep them ‘off’ when they’re not needed. Regeneration means the regrowth of a damaged or missing organ part from the remaining tissue. As adults, humans can regenerate some organs, such as the liver. 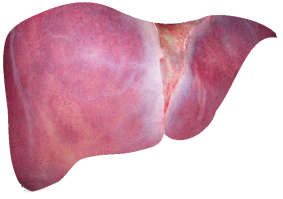 If part of the liver is lost by disease or injury, the liver grows back to its original size, though not its original shape. And our skin is constantly being renewed and repaired. Unfortunately many other human tissues don’t regenerate, and a goal in regenerative medicine is to find ways to kick-start tissue regeneration in the body, or to engineer replacement tissues. There are many animals that can regenerate complex body parts with full function and form after amputation or injury. Invertebrates (animals without a spinal cord) such as the flatworm or planarian can regenerate both the head from a tail piece, and the tail from a head piece. Among vertebrates (animals with a spinal cord), fish can regenerate parts of the brain, eye, kidney, heart and fins. Frogs can regenerate the limb, tail, brain and eye tissue as tadpoles but not as adults. And salamanders can regenerate the limb, heart, tail, brain, eye tissues, kidney, brain and spinal cord throughout life. How do these regenerative animals regrow such complex structures? After amputation, stem cells accumulate at the injury site in a structure called the blastema. An important subject of ongoing research is how signals from the injury site cause the stem cells to form the blastema and start dividing to rebuild the missing part. And what about the stem cells themselves? Do the animals use a single type of stem cell in the blastema that can differentiate into many different types of tissues (called a multipotent stem cell). Or is a separate set of stem cells responsible for making each of the different tissues needed to make up the new body part? Possibilities for regrowing a limb: Is one kind of stem cell responsible for making all the different tissues needed (A)? 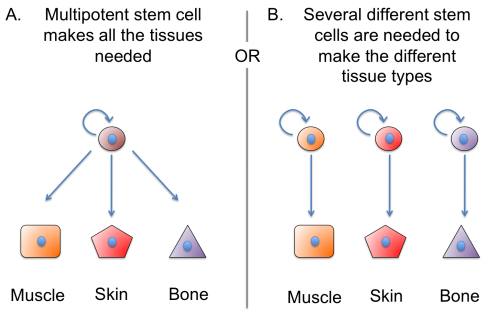 Or is there a separate set of stem cells responsible for making each of the different tissues? Recent research in different regenerating animals has shown that there are various stem cell strategies for regenerating body parts built from multiple tissues, such as muscle, nerve and skin. If we understand the principles and molecules these animals use to regenerate adult tissues, can these lessons be applied to regenerating or engineering human tissue? Scientist Peter Reddien’s research group in the USA recently solved a long-standing question in planarian (flatworm) regeneration – can a single stem cell regenerate a whole animal? The answer is yes, it can. This shows that adult planaria have pluripotent stem cells – cells that can make ALL the cell types of the animal’s body. How these pluripotent cells are controlled in the flatworm's body so that they do not form tumors is an important question that several research groups are now studying. But not all animals use pluripotent cells in regeneration. The stem cells that regenerate a frog tail and a salamander limb have very different properties from a planarian stem cell. In these animals, each tissue – such as muscle, nerve, or skin – has its own set of stem cells that just make the different types of cells in that particular tissue. In other words, a muscle stem cell cannot make skin and skin stem cells can’t make muscle. These multipotent tissue-specific stem cells are probably very similar to the stem cells in our own bodies that renew or repair tissues such as our skin or muscle. Why can such stem cells regenerate an entire limb in a salamander, but only repair damage to a single tissue type in our own bodies? This is another question that scientists are working on now. As well as using stem cells, regeneration can work by causing differentiated cells that had stopped dividing to ‘go back’ to dividing and multiplying in order to replace the lost tissue. This has recently been shown to happen in heart regeneration in zebrafish, where a heart muscle cell called the cardiomyocyte divides to replenish missing cardiac tissue. This regenerative phenomenon has also been found in newly born mouse hearts, but is rapidly lost as the mice mature. More research is needed to understand how differentiated cells can be made to divide and produce new heart tissue, and why this capacity is lost in humans. By defining the properties of stem cells that regenerate complex body parts, scientists are learning how injury causes these stem cells to regenerate the missing part instead of just forming scar tissue. Future research may make it possible to apply this knowledge in new kinds of medical treatments. How similar are the pluripotent stem cells of the planarian to mammalian embryonic stem cells or induced pluripotent stem cells? By studying the planarian, maybe we will gain insight into how to control human embryonic stem cells to replace parts of our own bodies. Salamanders and frogs use tissue stem cells that may be much like our own, so why can they regenerate a whole limb whereas we form scars? Ongoing research indicates that regenerative animals keep a kind of map inside their adult tissues, telling cells where they are and what they should be. Parts of this map may have been lost in mammals, or perhaps our stem cells have lost the ability to read the map. Researchers hope to find out what exactly is missing or blocked in mammals, and whether such information can be restored to direct stem cells to take part in regeneration for medical applications. Can we make adult, differentiated cells like heart muscle cells start dividing again, as in the zebrafish? It will be important to find out why mammalian heart cells lose this ability, and if it can be restored. This factsheet was created by Elly Tanaka. Planarian image by Peter Reddien. Salamander image in right-hand panel by Orizatriz. Remaining salamander images and all diagrams by Elly Tanaka. A young salamander can regrow a whole leg in about five weeks.